A former Anglican priest and member of the Personal Ordinariate of Our Lady of Walsingham gave the Latin Sermon at the University of Oxford this weekend. 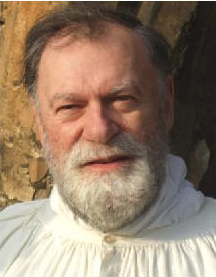 John Hunwicke, who is well known for his erudite writing on liturgy and Classics, gave the sermon -­‐ not a sermon in the usual ecclesiastical sense -­‐ in the University Church of St Mary the Virgin on Sunday 15 January, the first anniversary of the establishment of the Personal Ordinariate of Our Lady of Walsingham, with the permission and blessing of the Ordinary. Whilst still an Anglican, Blessed John Henry Newman (who is the patron of the Ordinariate) was the Vicar of St Mary's and it was from the same pulpit that he preached and John Keble gave his Assize Sermon, that the Latin Sermon is given. John Hunwicke joins other Catholics, including Professor Richard Parish, in giving the Latin Sermon. Here, below, is the same press release, but if you scroll down, you will see the original Latin sermon and an English paraphrase of the same.